Boxer cartridge showing the internal pellet that expands the projectile when fired into the rifled barrel. In 1867 the British war office adopted the Eley-Boxer metallic central-fire cartridge case in the Enfield rifles, which were converted to breech-loaders on the Snider principle. This consisted of a block opening on a hinge, thus forming a false breech against which the cartridge rested. The detonating cap was in the base of the cartridge, and was exploded by a striker passing through the breech block. Other European powers adopted breech-loading military rifles from 1866 to 1868, with paper instead of metallic cartridge cases. The original Eley-Boxer cartridge case was made of thin coiled brass - occasionally these cartridges could break apart and jam the breech with the unwound remains of the casing upon firing. Later the solid-drawn, central-fire cartridge case, made of one entire solid piece of tough hard metal, an alloy of copper, with a solid head of thicker metal, has been generally substituted. 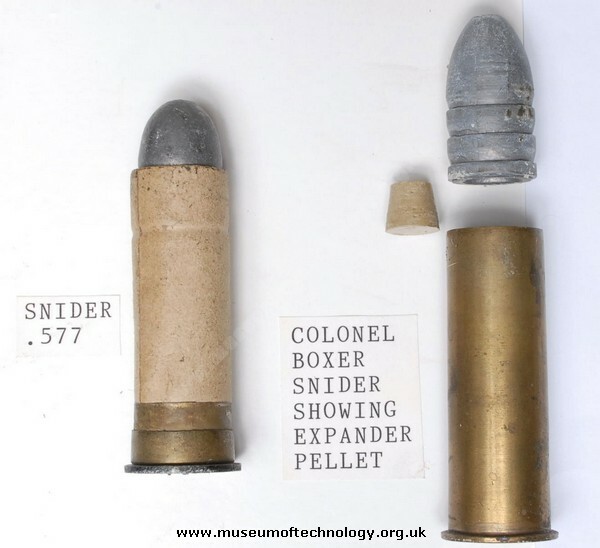 The principal on which Colonel Edward,M, Boxer, based his new idea was to solve the problem of getting the new breach loading rounds to fit snugly into the rifle barrel, but still allow easy loading of the round into the breach, if the principal of rifling was to work the projectile had to fit the barrel tightly, meaning that the round would have to be pushed hard into the breach, loading therefore could be difficult. The problem was solved by fitting a slug of clay into the cartridge prior to the lead bullet (projectile), this slug was tapered and almost fitted into a cavity in the bullet, when the round was fired the slug was forced into the bullet expanding the rear end, thus allowing the bullet to fit loosely into the barrel until fired whereupon the end expanded fitting the rifling perfectly.